I rejoined my favorite meetup group this past Saturday to hike through San Francisco's diverse neighborhoods. On this day, we walked through Sydney Walton Square in the Embarcadero by the waterfront. It has many pieces of art including the two I posted here. A map for a self-guided tour can be found here. I was drawn to this piece because of the dogs. 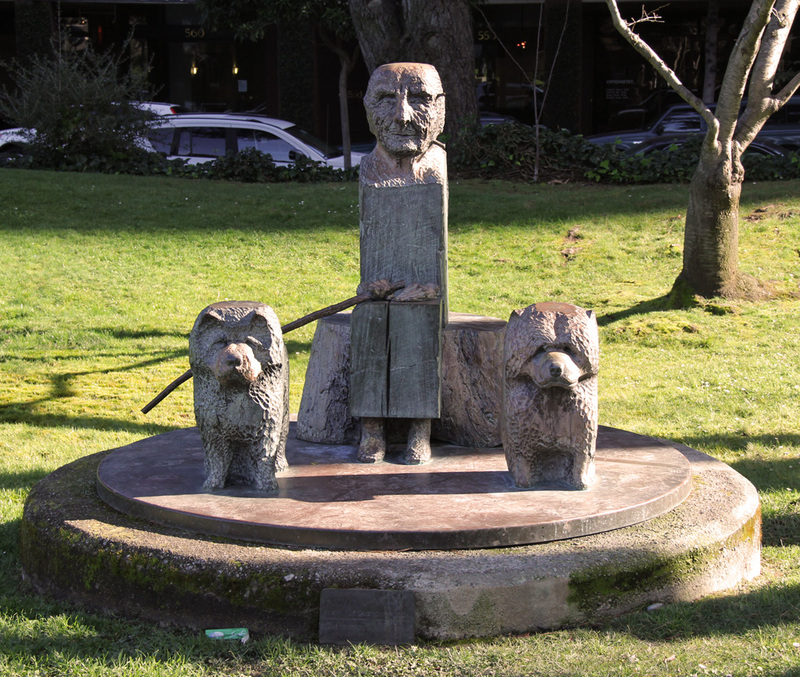 It is called "Portrait of Georgia O'Keefe" by Marisol Escobar (1982) based on a photograph Escobar took of the 90-year-old Ms. O'Keefe with her two show dogs. This piece is called "Pine Tree Obelisk" by Joan Brown (1987). This colorful tiled artwork includes crabs, trees, and seagulls, perfect in a park. Any local bloggers or readers who would like join in on future walks, let me know so we can meet. I've been to a couple blogger meetups and they are fun. A local lomo group has photowalks every now and then and I think it would be a blast. I don't know why but this obelisk makes me think of indians. Very interesting pieces of art. Thanks for sharing Karen. yes, we are in Vegas for 2 months, renting a condo from mid Dec until mid Feb.
River cruises are much nicer than a mega cruise. It is so easy to get around and no crowds. I like the O'Keefe and dogs statue. Shadows play there too. I think it goes without saying I would LOVE to join you. Joan Brown's work is some of my favorite in the city, and of course I have always been a fan of not only the Georgia O'keefe and her dogs but Sydney Walton Park. Love both captures, especially the O'Keefe sculpture! Wish I were there as the walks sound marvelous - San Francisco is one of my favorite cities. :) Thank you for dropping by, glad it led me here. i have not been in a meet up group, would love to join you if i were near. One day I am going to visit SF and I will absolutely join you on this walk! Walking and exploring is my new favourite pastime.